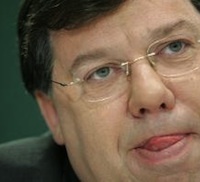 Introducing the catastrophic 400 billion euro blanket bank guarantee scheme in September 2008, Twenty-Six County finance minister Brian Lenihan was keen to offer reassurance to those genuinely fearful of the consequences of such economic recklessness. “There is,” he intoned, “understandable concern that the exchequer is potentially significantly exposed by this measure. I want to reassure the House and the Irish people that this is not the case.” The arrival this week of International Monetary Fund representatives’ in Dublin amply demonstrates the hollowness of Lenihan’s reassurance. This was the same minister who, at various points throughout this crisis, suggested that the economy had “turned the corner” was “on the road to recovery” and who offered further reassurances that the bank bailout was “the cheapest bailout in the world”. Reckless incompetence coupled with a stout defence of the interests of Fianna Fail’s financial backers, the bankers and developers, has been the hallmark of Brian Lenihan’s tenure as minister of finance. It is an office that, in recent times, has seated some notable proponents of crony capitalism: Brian Cowen, Bertie Ahern and Charlie McCreevy. Well, it seems now that the cheapest bailout in the world has not only cost the Twenty-Six County state over 50 billion euro and rising, but has driven tens of thousands of workers onto dole queues, exposed its citizens to the vagaries of international financial markets and has now resulted in the state surrendering its sovereignty to the IMF. Having already imposed swingeing cuts to the public sector, the Dublin government confirmed last week that it intended cutting a further 15 billion euro from the Twenty-Six County economy over the next four years, with 6 billion euro of these cuts to be implemented in next month’s budget. It is this slavish adherence to free market ideology which has created a deflationary spiral in the economy, resulting in massive unemployment, currently at 13 per cent, and once again raising the spectre of emigration. In order to save the failed banking system and bail out bankers and property developers, the Dublin government intends driving tens of thousands of households into penury. The McCarthy Report, published in July last year, has provided the template for the Dublin government’s programme of cuts. Right-wing economist Colm McCarthy presented Leinster House with a wrecker’s charter that proposed the effective dismantling of the public sector, the imposition of savage pay cuts on public sector workers, swingeing cuts in social welfare payments, increases in taxes on low paid workers and the privatisation of state assets such as the ESB and Bord Gais. It is a charter that will be grist to the mill of the IMF, an organisation well versed in the economics of the madhouse. Originally established following the ending of the Second World War, the International Monetary Fund came about as part of the Bretton Woods Agreement, its primary role at that time to provide short-term loans to states experiencing funding shortages and to manage the gold-standard currency valuation system. However, in recent decades the IMF’s role has been to provide long-term loans primarily to developing countries in return for the enforcement of ‘market discipline’ on vulnerable economies. Its neo-liberal mania has forced governments across the developing world to prioritise debt servicing and the imposition of savage public spending cuts and widespread privatisation. Its legacy has been the impoverishment of millions and the prising open of economies to allow vulture capitalists to profiteer from the sell-off of state assets. The neo-liberal doctrine promoted by the IMF played a notorious role in the Asian economic crisis of the late 1990s. The IMF encouraged developing economies in Asia to remove capital controls in the early 1990s, a decision which resulted in billions of dollars of speculative investment flowing into the Asian economies. However, when panic hit in the summer of 1997, the absence of barriers to capital control witnessed the outflow of approximately $100 billion from the economies of Indonesia, the Philippines, Thailand, Malaysia and South Korea in a matter of weeks. The subsequent imposition of so-called Structural Adjustment Programmes, which enforced public spending cuts, resulted in spiralling unemployment and drove millions deeper into poverty. In more recent times, the IMF has imposed severe austerity programmes in Europe. The 7.5 billion euro [6.4 billion pounds] loan offered to Latvia in 2008 was conditional on the imposition of a significant programme of cuts that included: 20 per cent public sector pay cuts, staff cuts of between 10 and 15 per cent in government departments, the closure of schools and hospitals and an increase in fees for third level education. Earlier this year, Greece was forced to accept an IMF/EU loan of 110 billion euro, which again came with austerity measures attached. These measures included an increase in the age of retirement from 63 to 67, swingeing cuts to public spending and public sector pay, alongside the privatisation of public services and state assets. However, the imposition of this austerity programme has driven the Greek economy into a deep recession; it is estimated that the economy will contract by 4.2 per cent this year and by 3.0 per cent in 2011, while unemployment has soared to over 12 per cent. It is increasingly clear that the austerity medicine is actually killing the patient. This is the scenario facing the population in the Twenty-Six Counties. However, it should be emphasised that the Fianna Fail/Green Party coalition and the so-called opposition parties in Leinster House are willing partners in the imposition of austerity measures; acquiescing in the EU demand for a reduction in the budget deficit to three per cent of GDP by 2014. A consensus has been reached amongst the political establishment that the working class should shoulder the burden of a global capitalist crisis, one that has been exacerbated in Ireland by the decision to offer a blanket guarantee to the private banking sector. No amount of establishment hand wringing or wailing about the loss of sovereignty should diminish their culpability in the destruction of the economy and the impoverishment of the working class. That said, the interference of the IMF into the affairs of the Twenty-Six County state is a serious development and should be resisted at all costs. It is an affront to democracy that this organisation, which has wrought misery and devastation upon nations across the globe, should be allowed dictate the affairs of a section of the Irish people. The IMF is an undemocratic and unaccountable enforcer of the neo-liberal doctrines of the small state, of deregulated markets and of privatisation. It has no constructive role to play in the affairs of the Irish people and will simply enhance the dictatorship of the markets. While the IMF sets about driving the working class into penury, the rich in Ireland will be encouraged to invest their vast wealth into purchasing our public assets. The sell-off of state companies such as ESB will be encouraged by capitalist parasites such as Denis O’Brien, Michael Smurfit and Peter Sutherland, who will seek to make billions on the back of the privatisation of these state assets. There is no doubt but that the economic crisis and the IMF takeover will be used to create a further boon for the wealthy, an elite that continues to control wealth in excess of 120 billion euro. The Irish Congress of Trade Unions has called a rally for Saturday, November 27. It is to be hoped that this is the beginning of a serious fight-back by the trade union movement in Ireland, whose leadership to date has failed utterly to respond to the establishment war being waged on the working class. A sustained campaign of resistance is required to drive the IMF out of Ireland and Fianna Fail out of office; to halt the planned savage programme of cuts and to appropriate the vast wealth currently in the hands of a tiny class of pilferers. The calling of a general strike by the trade union movement is a necessary step in commencing the fight back.